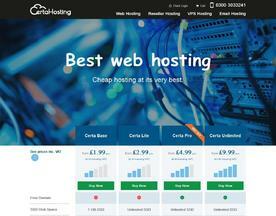 A UK Linux Hosting provider offers a web hosting service that runs on a linux or UNIX-based operating system. UK Linux Hosting has several benefits over its hosting counterparts: Security, Support, Stability, Easy Admin and finally, the cost. If you're looking for online services similar to UK Linux Hosting, consider our Windows Hosting or VPS categories. We’re the best value Linux hosting provider in the UK. With cPanel control panels, guaranteed uptime of 99.9% and UK-based servers, we’ll keep you online 24/7. Migrate in minutes with no downtime. Our friendly UK customer care team are waiting.